Earlier this summer, as my girlfriend and I drove north on a short vacation, I called up another album via her iPad, loaded with a slew of our favorites. “Oh, heck yes.” This as the opening notes of Hysteria’s 'Women' played out. A couple of songs later she then turned to me with a smile and a laugh. Which, granted, I do. But I like this and yes indeed, I was at least humming along to most of it and probably singing along to a bit of it - or more - as I went. God help me if I ever tried it at karaoke, though, because Joe Elliott I’m not. So talking about the 25th anniversary of this album, this amazing hour of music, is practically a gift. 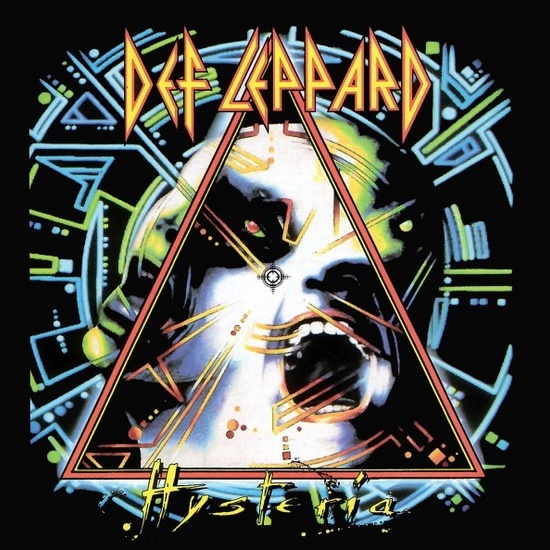 No bones about Hysteria, never have had any, loved it from the get-go and I might love it even more now. I may have things from the time I still love, but I don’t actively listen to any album at all that I overdosed on high school on even a demi-regular basis anymore, because it scratches no itches. This is the one exception. Nostalgia of course informs a lot of it. In some ways I was already primed for nostalgia even then - Def Leppard and Duran Duran more than any other bands were the groups that set initial lodestones for my taste in middle school with their American breakout albums; I played Pyromania and Rio to death. Duran kept going, had side projects, the whole nine yards, but Def Leppard seemed to disappear after Rick Allen’s car accident and lost arm, and I wasn’t any sort of music press reader, metal-specialised or otherwise, so I had no idea what was going on. That all changed pretty quickly after 'Women', this album’s lead single in the US, came out. Well to heck with that, of course. It’s a metal album because it sounds like a goddamn metal album, massive beats, great riffs, end of story, don’t question me. But it’s not just a metal album - it never was - and that’s why Hysteria works then and now, a classic album in the pop firmament, a monster like Rumours or Thriller. Heck, it even had its own entry in the Classic Albums documentary series, and you should see that immediately before coming back here; combined with David Fricke’s actually pretty good liner notes for the reissue a few years back, it tells a story of false starts and studio perfectionism that makes Brian Wilson in his pomp seem rushed and slapdash. Now, it’s not a start to finish perfect album, no. But pretty close, down to having deep cuts, even cult B-sides that became unexpected Greek hits and/or concert staples. Of the twelve songs, maybe 'Excitable' and 'Don’t Shoot Shotgun' kill time a bit, but otherwise that’s over three-quarters of the thing being stone cold keepers. And why it all works, beyond the simple pleasure of hearing it, is how it scores on three fronts: building on and perfecting the past, being an utterly in-the-moment album of its present and completely reshaping the future. Don’t believe me? Past: It didn’t take the Leps’ seventies covers album Yeah! in later times to confirm this. Hysteria was the final awesome world-beating triumph of UK glam about fifteen years after the fact, everything about the frenetic, showy and shouty run of acts that took over British and to some degree European charts finally turned into American and world omnipresence. 'Rocket' was the most obvious nod, both song and video stuffed to the brim with music references, but the whole album played around with it with its beats and riffs as noted, and a lot more. 'Run Riot' for instance, is the near chronological and conceptual midpoint between the Sweet’s 'Teenage Rampage' and the Prodigy’s 'Firestarter' - fake rebellion as exuberance as sonic playground (and when they kick in with the extra harmonies halfway through the chorus, oh man). Meanwhile, 'Armageddon It' heads out the door with T. Rex’s 'Get It On' riff and hits each chorus with the kind of full-band harmonies Queen did as a matter of course - and THEN adds a big gang shout Slade would kill for. But if that’s all they did then it would have just been a pastiche, and we wouldn’t be talking about this. Present: Credit to Lange and the band in tandem for this, next to nothing sounded more perfectly 1987. This was a true triumph-of-the-CD artifact, at an hour just starting to herald the 78 minute bloat era without tipping into it, demanding a dynamic but equally precise range to boom out of increasingly digital setups. It exists in triumphant excelsis, it actually sounds like the huge monster smash it ended up being instead of the beached whale fate it avoided. It may have come out the same year as Appetite for Destruction, but its truest sibling would have been 1986’s Slippery When Wet - though a couple of touches aside, Bon Jovi’s supposed masterwork sounds like weedy trash in comparison to what Lange and company cooked up. Certainly in comparison to all the amiably trashy LA yank-em-and-crank-em-and-party-on-dude glam efforts breaking out, it was a goddamn sonic bombshell. Or perhaps more appropriately, Lange was the field’s Bomb Squad - you can’t call Hysteria Public Enemy by any stretch, but released as it was between Licensed to Ill and Run DMC with Aerosmith and It Takes A Nation Of Millions the following year (there was a reason why 'Pour Some Sugar On Me' was THE hit in America, and why the second line in the song, at least on the album, was 'Walk This Way'), no surprise it sounds even more today like the cut-up and reassemble note-by-note effort it was, everything recorded separately and then Frankensteined into existence. I could go on about 'Rocket' in particular again - and its remixes - but instead, consider 'Gods of War'. Or rather, consider it up against another song from that same year, 'Dogs Of War' by Pink Floyd, not to mention 'Russians' by Sting, 80s Cold War products all. To say those latter two songs are lumbering pretentious disasters ruins the good name of that phrase. 'Gods of War', meanwhile, the joker in the pack on an album about love, lust and loss, is attractive ominousness, from the eBow zone of the opening tones emerging from the gunfire and chants, the stately main riff, the staggered backing vocals on the chorus and especially the insane ending, with the steady arrangement slowly crushed under the weight of a collage of politician and warzone samples that rivals anything else at the time on Wax Trax or among found-sound types. It’s a perfect unintentional balance of two other contemporary Northern English artistic figures, Tony Scott’s hypermilitaristic technophilia of Top Gun and the agonizing operatic melodrama of the opening seconds of the Pet Shop Boys’ 'It’s a Sin'. Even more retrospectively unsettling was that the specific context of all the Reagan and Thatcher samples wasn’t so much Cold War as it was Middle East power games: the bombing of Libya, the use of the UK as a home base for the aircraft. When you hear Reagan’s voice emerge with “We will NOT cave in!” followed by a blast of a missile launch from speaker to speaker, the next 25 years seem predicted all too coldly. Future: Hysteria’s success inspired imitators and clones and more in the fields one expected, naturally - after all, who wouldn’t want to try for it? But it was so self-contained a success in the end, so much of an indulgence and crossed fingers by the label and management as much as the band, that nothing could come close, so monumental it was unrepeatable, not least by the band themselves. Years before the nowhere-near-as-great Adrenalize emerged in 1992, Guns N’Roses became an alternate model for an easier to do, more ‘real’ hard rock, Metallica’s ...And Justice For All finally took thrash towards the mainstream, the rejection of LA glam trappings across the board soon followed suit. Meanwhile in Seattle, etc. After a time, though, it became clear that mainstream rock-as-such in the States never wanted to escape from Hysteria at all - as pop-punk and emo and mall punk and whatever all coalesced year by year, it was pretty clear Hysteria’s songs and approach proved to be a well-polished model for endless amounts of bands, something incredibly bright and shiny to emulate. Not just there either - to pick just two examples: Andrew WK and The Darkness may come from different worlds but they’re both Sparks fanatics, glam fanatics, freaks about orchestration and arrangement, and two to one says they got clued into it all even younger thanks to Hysteria. If anything Hysteria, reclothed in country trappings, has become more entrenched and voracious now, as a double-wave of new artists and newer nostalgia for 80s high school days means you can’t find a country station here in America without hearing guitar parts and harmonies and tight arrangements everywhere all flowing from that central source, a crypto-Sgt. Pepper’s for the genre. Taylor Swift talks about growing up on them thanks to her Leps fan of a mom, Lady Antebellum’s AOR smashes work in a lot of awfully familiar sounds and textures and hey, Eric Church? The guy may have the biggest country crossover hit this year in America and it may be called 'Springsteen' but listen to that and then listen to the elegant perfection of 'Hysteria' itself, and ask yourself where all that particular blend of guitars and yearning actually may come from. But the fact that so many female musicians or female fronted bands like Shania, Taylor and Lady A have all built on Hysteria tells something else too, if you’ll allow a little (painfully) amateur sociology. All the women in the audience in their concert videos at the time were probably a sign to start with, but over the years, I couldn’t begin to count the number of women I know or have met - listeners, more often than not musicians as well - that love Def Leppard and really adore that album in particular. Singers, guitarists, performers, it goes on - it may not be an absolute favorite of every last one but it’s up there, with showers of praise for the arrangements, all the twin guitar parts, the harmonies. Who knows if that explains in part the lingering ‘real metal’ disdain for it, or parallels it, but I’d also argue something else: compared to so much of the stultifying and/or angry sentiments of dude rock - hell, dude music, dude everything - then while Hysteria is no less dude, the feelings are of fun energy, sly come-ons, something celebratory, something that, for lack of a simpler way to put it, always loves and, outside of war itself, never, ever hates. All that, and all the ballads are either thoughtfully fraught or wistfully melancholy rather than trying to be sweet nothings or sensitive bro pleading. Compare it to so much now that’s ‘arena rock’ and it’s almost laughable. Coldplay sure never could be as cheery. Muse wish they could be as effortlessly easy-going. And where Green Day has finally ended up now, please. Step inside. I GIVE YOU!